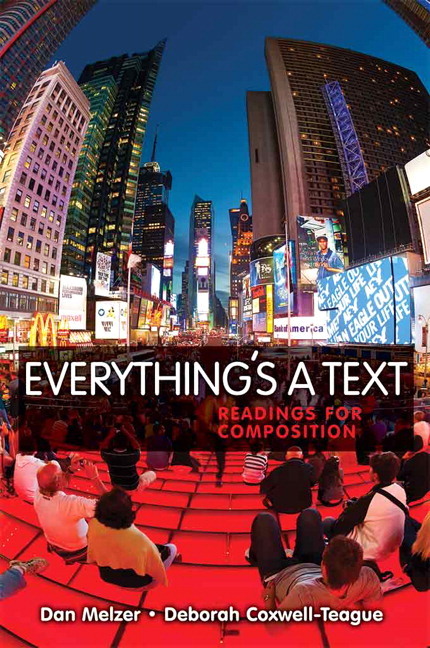 Everything’s a Text: Readings for Composition helps students develop reading and composing skills critical to succeeding in college and beyond in our information age. To be literate today means more than being a strong reader and writer of print texts. Students must excel at analyzing and composing print, visual, and digital texts–and those that combine these mediums. Contemporary definitions of literacy are expanding to include cultural, academic, civic literacies, and more. Everything’s a Text features chapters dedicated to each, with readings and projects that help students analyze and compose in a variety of situations, for different purposes and audiences, and in a range of genres. Contemporary readings range from essays and articles to blogs, photos, lyrics, editorials, graffiti, advertisements, posters, and more so that students develop their abilities to think critically about the kinds of texts they encounter daily. Assignment options range from reflections, textual analyses, and researched arguments to documentary films and poster campaigns to give students practice at producing a full range of texts in circulation today. Readings that investigate different kinds of literacy. Chapters 3-9 each open with a reading authored for Everything's a Text that explores different definitions of the literacy that is the chapter’s focus (visual, digital, oral, etc.). Students and instructors can use the reading as a discussion starter and foundation for analyzing the texts that follow. Topical readings clusters within chapters. Some readings within each chapter are arranged in topical clusters so that they “speak” to each other in conversation. Rather than provide simple pro/ con arguments, these challenge readers to consider a variety of perspectives on complex issues. A rhetoric of reading and writing instruction. Chapters 1 and 2 establish a foundation that includes a framework and common language for key concepts such as literacies, purpose, audience, persona, medium, genre, and context. Strategies for reading and composing support students as they move through the selections, questions, and projects in the anthology. Literacy Connections. After each reading, questions help students recognize and understand important or nuanced ideas, encourage reading response and analysis, and foster connections to other readings in the chapter. Literacy Projects. Closing Chapters 3-9 are Literacy Projects that foster more formal composing and often involve research. Projects range from writing a textual analysis or a researched argument paper to creating a documentary film or composing a poster campaign so that teachers have a variety of writing options to assign or adapt. Color inserts. Inserts throughout the book present visual reproductions of fine art, web sites, photographs, advertisements, posters, and even graffiti in full color to offer a richer discussion of visual texts, while headnotes and questions encourage critical thinking and writing. Student case studies of work in progress. Case studies of student writing in Chapters 3-9 show student work in development from brainstorming through drafting, peer review, and revision to help students understand writing as a process. Model papers in MLA, APA, and CSE styles. Three researched and cited student texts are also presented as models for formatting in the academic styles established by the MLA, APA, and CSE so that students have models for academic formatting conventions they are likely to encounter in the general education curriculum (Ch. 8). Freewrites. Within Chapters 1 and 2, Freewrites provide informal writing activities that encourage reflection on literacy experiences; analytic thinking about different kinds of literacy; and practice thinking critically about purpose, audience, genre, and medium. Chapter 1: What Is Literacy? Excerpts from personal essays by Sherman Alexie, Paule Marshall, and Gloria Anzaldúa. What Are Popular Culture Literacies?